The history of the band begins in 2008 in Tomsk on the ruins of the promising brutal metal band Committee. The remaining musicians Irina Sidenko (vocals) and Yevgeny Zimin (bas) allied with the former APOKEFALE band member Evgeny Tsybulin (guitars). By joint efforts they developed the concept of the new formation, which has been successfully embodied under the name of DEHYDRATED. With the assistance of the drummer Aleksey Ablaev the band recorded its first demo (�Suffering From Mummification�) consisting of three professionally recorded songs. After recording the EP the band concentrated on live performances. Gigs in different towns and cities of Siberia were followed by headlining in big three-day Siberian METAL HAIL FEST in Irkutsk together with EXVENTER, APOKEFALE, and WELICORUSS. In October 2009, one year after the formation of the band, DEHYDRATED went on promotional SCREAM of TERROR tour 2009 in support of the EP in European part of Russia. The most part of the tour gigs were played together with French masters of grind PULMONARY FIBROSIS and BAPTIZED IN VAGINAL LIQUID. The tour was crowned with participation in the most brutal grind festival � PETROGRIND # 6 (St. Petersburg) featuring such bands as INHUMATE, TORSOFUCK, GRIND CRUSHER, TREMOR, and SEPTYCOPIEMIA. In March 2010 DEHYDRATED took part in local city festival MUZ-ONLINE and was granted winner under the HARD-line nomination by jury. In November 2010 DEHYDRATED signed the debut full-length album release contract with MORE HATE Productions. 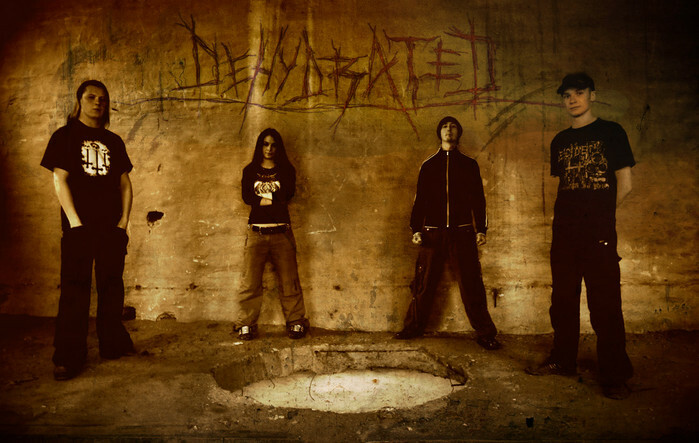 In 2011 DEHYDRATED participates in METAL HEADs MISSION festival. In December 2011 the band releases a 5-song ?? �Mind Extract�. In summer of 2012 DEHYDRATED focuses on recording of the new full-length album �ZONE beneath the SKIN�, later released by HEADXPLODE Records. The release of the album is followed by extensive touring between 2012 and 2013. In winter of 2013 DEHYDRATED makes its first European tour titled Anniversary winter tour 2013, and as early as in summer of 2014 the band goes to its largest (for the day) GANGSTERS of the ROADS Euro tour 2014. The tour includes 25 cities of Poland, Czech Republic, Slovakia, Germany, Italy, Bulgaria, Ukraine, Hungary, Macedonia, Romania, Serbia. During this tour DEHYDRATED plays seven open air festivals: OBSCENE EXTREME fest, DEATH FEAST, AGGRESSIVE MUSIC fest etc., sharing stage with such monsters as IMMOLATION, MISERY INDEX, MORGOTH, VADER, KATALEPSY. The work on the new material is commenced in autumn of 2014. By the end of 2015 the third CD titled "Awake in Era" (December, 2015) is finally out.